KYODO - Stores love them, but the patience of residents is wearing thin. 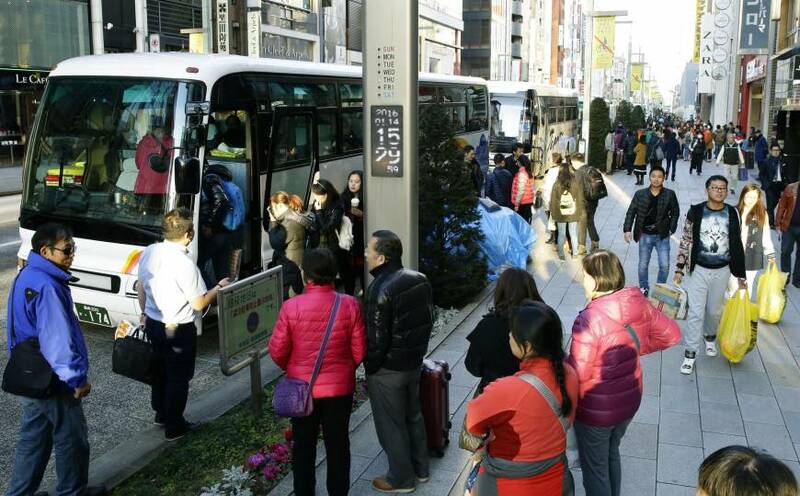 Complaints have been pouring in about tour buses parking where they shouldn’t in Tokyo’s most popular shopping districts. Police ticket the buses sometimes, but mostly they just field complaints from locals and motorists. A surge in foreign tourists has brought massive dividends for stores where Chinese tourists splurge and head for the airport lugging rice cookers and hair care products. The problem is, there is nowhere for the buses to park in the parts of Tokyo the shoppers want to visit. 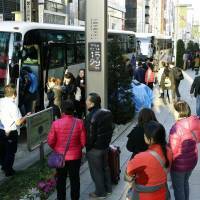 One day in early January, eight stationary tour buses were seen occupying the left-hand lane of a four-lane road on a main street in the upscale Ginza shopping district. The buses were waiting for tourists who had finished shopping at department stores and boutiques to board. On the sidewalk, Chinese tourists holding shopping bags were instructed by store security to open a path for pedestrians. A number of seats in the bus remained empty 10 minutes past the meeting time as stragglers failed to emerge. Police can caution the buses to move on, and they do. But the driver will often circle around the block for a while and then return to the same spot. The Japan National Tourism Organization says a record 19.7 million visitors came to Japan last year. Tsukiji Police Station, which is responsible for the Ginza district, reports receiving numerous complaints about parked buses blocking the streets over the past two years. 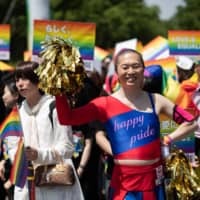 But it is also happening at other tourist sites, too, including near Sensoji Temple in Asakusa and the Kabukicho area in Shinjuku, according to the Metropolitan Police Department. There is concern that haphazard parking may lead to accidents, but some argue rather than discourage the vehicles better provisions should be made. “The central and the Tokyo metropolitan governments need to take the initiative to provide more parking spaces if they are going to promote tourism,” said a leader of a local business association for the Ginza shopping area. 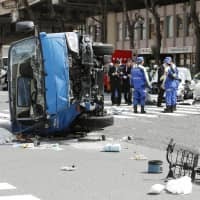 Tokyo’s Chuo municipal office plans to suggest that the metropolitan government, which owns Tsukiji Fish Market, use the site as a parking lot after the market moves in November. “Instead of tightening regulations, we would like to unite with municipalities and stores to decide on appropriate rules to welcome tourists together,” said a Metropolitan Police official.